Native Americans, Mountain Men, and Pioneers lived, worked, traded, and traveled on the California Trail. Their stories are as varied as the people who lived them. Native Americans were impacted by the emigrants, the land was transformed by industry, and Mountain Men who once hunted and trapped became guides for the Pioneers moving west. Learn about some of the significant people and their impact on and contributions to the history of the West. Weathered face, fur skin coat, knee-high moccasins, a flintlock and knife, good fighter and hunter, leading a solitary life – these are things we imagine when we think about Mountain Men. These young adventurers left their homes in the east for the wilds of the West. Jedediah Smith, William Sublette, and Jim Bridger are some of the men who mapped new areas and blazed trails throughout the Southwest, West, and Pacific Northwest. Many became guides on the California Trail leading wagons of hopeful emigrants to their new lives in California. Their influence can still be seen along the California Trail. In addition to mountain men, were many other California Trail pioneers. Whether the traveler was an individual or part of a larger group, each made the long and often treacherous journey west for a variety of reasons. Trappers, gold prospectors, traders, people seeking religious freedom and many more gambled their hopes on a brighter future as they crossed the desert. Many of us living in the western United States today can trace our heritage back to these brave pioneering peoples. Mountain Men and other pioneers traveling the various trails west had to learn to anticipate and interact with the many different tribes who inhabited the surrounding lands. 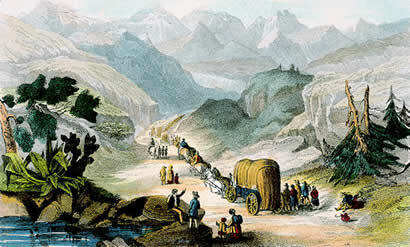 While old westerns are rich with scenes of continuous war and tribulation because of these interactions, documented first-person accounts of pioneer encounters with tribes along the California Trail show how much early travelers benefited from the familiarity these native peoples had with their lands.